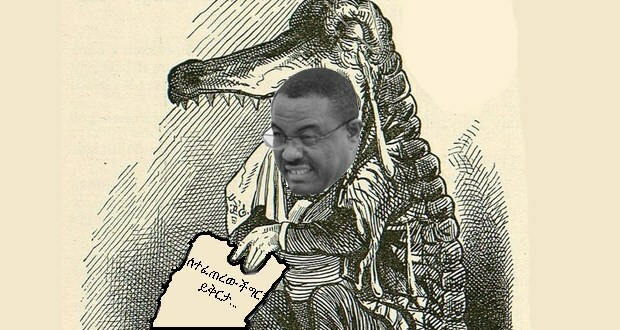 The T-TPLF Crocodile Weeps in Ethiopia! Hailemariam Desalegn and his T-TPLF have massacred hundreds of people over the past few months. Now, they are on a charm offensive. What do you think is the reason why problems in the kilils [bantustans/homelands] have not been resolved speedily? What is the current situation like? What do you say are the sources of these problems? It is obvious that the questions were planted in advance for Hailemariam Desalegn, the T-TPLF (Thugtatorship of the Tigrean People’s Liberation Front) marionette prime minister, to punt, to score a penalty kick without a goalkeeper. We have said that in all areas we have problems of good governance. In Oromia, our farmers did not get into the conflict. But they have presented questions. When different elements changed it into bloodshed, the farmers turned away. They said they don’t want it. They said we presented questions. The questions are correct. They said their question is about good governance. But they did not want to start a situation where there will be bloodshed. They wanted this party and the ruling regime to answer the questions for them. So the lesson we learn from this is that hereafter whether it is farmers or urban dwellers, because they are [politically] conscious, we cannot live stuck to their shoulder [back]. [Hailemariam’s Amharic metaphor sounds much like, “We cannot be monkeys on their backs.] Things that need to be corrected, we have to correct [them] speedily. We have to take ownership of the problem. When this is done, I have no questions [doubt] that other [destabilizing] elements will fail. Therefore, the major issue is inside the ruling party and EPRDF party, membership organizations, auxiliary organizations in the kilils [ethnic homelands] is to fix the problems of rent-seeking [ripping off the system], corruption, bad administration. What exactly is Hailemariam’s hidden agenda? Is Hailemariam sending up a trial balloon to gauge public reaction? Is he trying to draw sympathy? Is he pocking his finger in the hole in the dam to stop the flood that is about to scrub and wash out the T-TPLF? Did Hailemariam’s T-TPLF bosses put him up to this stunt in “parliament”? The whole good cop bad cops routine with the Q&As was pretty entertaining. What exactly is Hailemariam saying? I hear him talking but I am not feeling him. I hear him saying that the popular uprising in Ethiopia against the T-TPLF is the work of “outside agitators”. What does that mean? The people are so dumb that somebody has to point out for them that they are being taken for a ride; the T-TPLF is ripping off their land and it is their fault for being homeless. I hear him saying there is no mass uprising against the T-TPLF. Just polite farmers asking abstract political questions about good governance and that sort of thing. I hear him saying there is no issue of T-TPLF land-grabbing, only general discontent about corruption, rent-seeking, etc,. Hailemariam is talking loud but sayin’ nothin’. How simple-minded for so many of us to be duped by the T-TPLF media circus. No wonder the T-TPLF can play circles around us time and time again. We are so eager to beat our chests and declare victory at the first sign of what appears to be self-criticism by the T-TPLF. We blow things out of proportion. Hailemariam/T-TPLF “apologizes”? What the hell does that even mean? Is Hailemariam really apologizing? If so, for what? For of hundreds of unarmed demonstrators the T-TPLF massacred? For land-grabbing? For corruption? For abuse of power? For imposing a reign of terror on Ethiopia for a quarter of a century? So many of us in the diaspora are quick to forget that the T-TPLF is a vampiric organization. The T-TPLF thrives by sucking the vitality of everything around it. Hailemariam’s T-TPLF bosses do not know the meaning of the word “apologize”. Did Meles Zenawi ever apologize for the hundreds of unarmed protesters whose massacres he personally ordered following the 2005 election? Has the T-TPLF ever apologized for the 2005 election massacre? The only thing the T-TPLF bosses know about “apologizing” is having their victims apologize to them. The T-TPLF calls it “pardon”. The T-TPLF will falsely accuse someone, jail them indefinitely, bring them to their monkey (kangaroo) court when they want, get them convicted, sentenced to years and then demand an apology as the price the victims have to pay to get out of jail. That is the only kind of apology the T-TPLF knows. The T-TPLF jailed my young sister Reeyot Alemu to 14 years, reduced to five on appeal, and kept her incarcerated for 4 years because she refused false testimony and for refusing to apologize to the T-TPLF and get an early release. The only reason Hailemariam is cranking out all that drivel in the T-TPLF monkey parliament is because he is forced to face the facts by the people who are defiantly rising up against him (symbolically of course; one cannot rise up against a marionette/puppet) and his T-TPLF bosses. The people have crossed the Rubicon, the point of no return. The T-TPLF has got to go, go, go… and NOW! The fact of the matter is that Hailemariam and his T-TPLF bosses can see before their eyes the ethnic federalism ball of yarn they have been weaving for 25 years is unravelling. As it unravels it is entangling them completely. The more the T-TPLF tries to untangle the yarn, the more the T-TPLF gets tangled in it. Ethnic federalism is today T-TPLF’s tar baby. Ethnic federalism is stuck on the T-TPLF and the T-TPLF is stuck on ethnic federalism. The ethnic federalism “Frankenstein” the T-TPLF created is now getting ready to gobble up the T-TPLF. Hailemariam’s monkey parliament drivel is the beginning of the T-TPLF’s charm offensive to get into the good graces of the Ethiopian people. Too late. The resistance to T-TPLF tyranny is spreading like wildfire throughout the country. I predicted almost 10 years ago the fire the T-TPLF started would one day consume it. The T-TPLF started the ethnic federalism fire. Now the ethnic federalism fire is consuming the T-TPLF. But I absolutely agree with Hailemariam on one point. Yeah, the T-TPLF monkey has been on the backs of the Ethiopian people for a quarter of a century. Get that damn monkey off their backs! What Hailemariam did not say is that the people of Ethiopia are not only “awake” but they are also keeping their eyes wide open. They can see everything. They can see the T-TPLF is a clay-footed vampire. They are not afraid of it. The T-TPLF is scared, _ _ _ tless. Hailemariam’s blithering pronouncements are intended to be an olive branch, a peace offering. But Ethiopians must see through T-TPLF’s smoke and mirrors games. The T-TPLF wants to fool the people into believing that they are sorry, contrite, chastened, humbled. The T-TPLF wants to confess they have learned their lessons. They have been bad boys. Yeah, right! But is all a game. The T-TPLF bosses believe they can stay in power forever playing their stupid games by outsmarting, outfoxing, outmaneuvering, out-finessing and out-tricking their opponents. Hailemariam’s answers in monkey parliament represent colossal insults to the intelligence of the Ethiopian people. Hailemariam lectures the people that the problem is the absence of good governance, the intensity of corruption, maladministration and rent-seeking (his most favorite phrase which he repeats every media chance he gets to impress his intellectual pretentiousness). Hailemariam talks about good governance!? Didn’t Hailemariam and his T-TPLF bosses claim they had won the 2015 elektion by taking 100 percent of the seats in their monkey parliament? By the way, I predicted the T-TPLF would declare victory by 100 percent a year before the May 2015 elektion. I don’t get it. What the hell is wrong with this guy? Can’t he see that the ultimate proof of bad governance is that one party wins 100 percent of everything!!! Or is he just parroting what his T-TPLF bosses are telling him? Is the one hundred percent election victory the catastrophic failure of “good governance” that Hailemariam was talking about? Hailemariam is directed by his T-TPLF bosses to mount a charm offensive to get the T-TPLF’s read end out of the ringer. I get it. Hailemariam is told by his T-TPLF bosses that the T-TPLF has learned its lessons and it is reasonable. The T-TPLF will be nice from now on. Let bygones be bygones. Forget and forgive. Swear it. Scout’s honor. Sniff… sniff… Is Hailemariam also insinuating, implying that the T-TPLF is kinda, sorta ready to “negotiate”, “reconcile”? Hailemariam and his T-TPLF bosses know three things for sure now: 1) They can no longer play their game of killing and massacring to cling to power. 2) The people have reached a critical mass and mass uprisings are forming everywhere. 3) The T-TPLF is in its end game. The only question is whether Hailemariam and his T-TPLF bosses can bull_ _ _ t their way out of this mess. I tried to arrange an imaginary interview with Hailemariam to find out. When I called the imaginary number, a marionette (puppet) answered. Silence. The sound of silence. I found out marionettes (puppets) don’t talk. Their voice comes from their puppet master. Aha! I have tough words of warning to All Ethiopians. Never forget that after the crocodile is finished shedding tears, he is still a crocodile.